So Peacocks is now doing a make-up range, called ‘Evie Glam’ and you know what – it aint half bad. The colours are all really nice – I’m particularly impressed with the blusher (in somewhat ‘Benefit’ like packaging) it’s a lovely colour peachy pink shade with a bit of a subtle glow to it when swatched. It’s just crying out for a Coralista comparison and at only £4 – even if it’s not a dupe, it’s still a fantastic product. 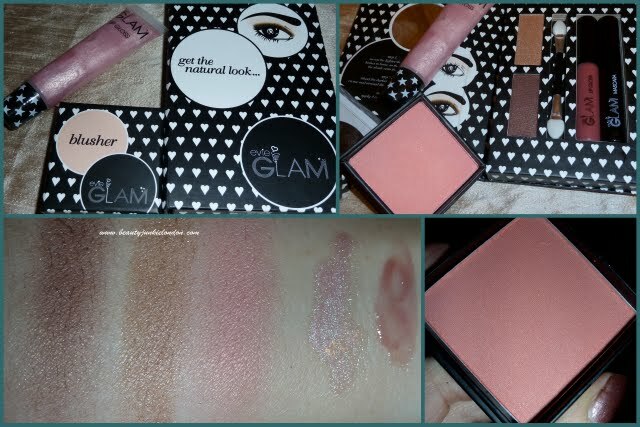 The swatches above are the eye shadows in the ‘natural look’ palette, the peachy pink blush, the pale lipgloss and the pinky lipgloss that comes with the palette. The darker pink gloss looks quite dark in the tube, but when swatched it’s a lovely colour that will do a ‘my lips but better’ look perfectly. There’s also a mascara in the ‘natural look’ palette, I haven’t tried this yet – but the brush is a comb style. The natural look set also comes with a rather odd shaped applicator – it’s just with the standard sponge tips, but with a really long wand bit in the middle. Maybe just me (I never really use the applicators that comes with eyeshadows) but it seemed a bit un-necessary. Packaging wise, it’s simple but effective. Monochrome with either little white hearts or little white stars – very cute and kinda reminds me of the Topshop style (white with black dots). Over all, I would say that for a budget make-up range the Peacocks guys have done a great job and I expect I will get a lot of wear out of the blusher. Prices start at £2 (the pink gloss is £2) the blusher is £4 and I’m not 100% sure how much the palette set is – but doubt it’s anything over £6…. Here’s the blush compared to coralista: coralista on the left and the peacocks version on the right. Pretty similar, no? Aw I wish I had a peacocks!